Motion Picture Title: Germ (2009) http://www.imdb.com/title/tt1495776/?ref_=nv_sr_6 (Assistant Art Director-Bryan Matthew Boutwell –Responsible for Special FX, Make-up, Set Design, Props. -Acting Roll-zombie. Film Location=Syracuse NY) I was hired as the Assistant Art Director & Actor on the B-Horror Movie Germ. 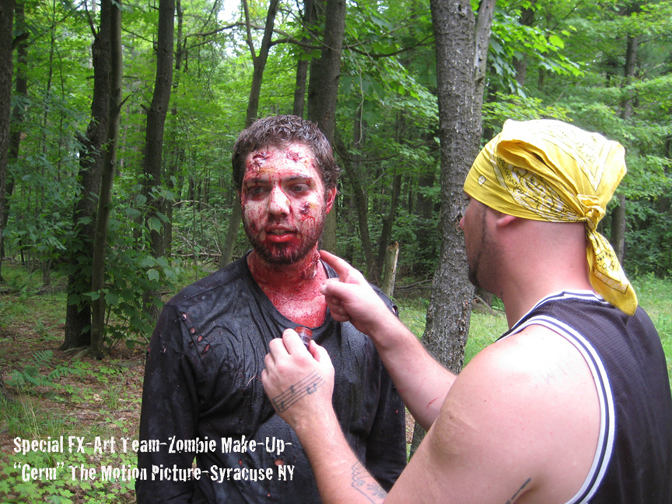 In this photo I am applying the make-up and dead skin to the leading roll’s zombie. I had to be constantly touching up the make-up because it was 95 degrees and humid that day. The repetition of action takes also made it difficult to keep the make-up and blood from drying between shots. Working on a horror movie is an artist’s dream job because you are involved in every aspect of the movie. Its fast paced and you have to constantly be inventing solutions to new problems that come up on the set. We concocted the blood from Karo Syrup and other ingredients, which also brought challenges because it attracted the mosquitos and other bugs being that we were deep within Highland Forrest while shooting the movie.